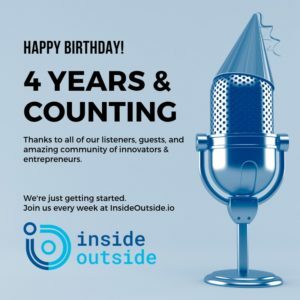 The Inside Outside Innovation podcast explores the ins and outs of innovation with raw stories, real insights, and tactical advice from the best and brightest in startups & corporate innovation. Each week we bring you the latest thinking in Corporate and Startup Innovation, Design Thinking, Lean Startup, Corporate Venture Capital and more. Join the movers, shakers, makers, founders, builders, and doers to help speed up your knowledge, skills, and network. Who do you want to hear from in year five? What topics are most important to you? Let us know!